Ever since I became aware of the probable location of the only other “seven ditches” named in an Old English charter boundary description (and I still haven’t come across any later-recorded namesakes to add to their number), I wanted to pay a visit to the site in Dorset to see the extant earthworks first-hand. I wasn’t necessarily expecting what survives to be identical with their Surrey counterpart – such things are pretty hard to do when there’s no trace of that earthwork remaining – but did consider that present-day characteristics common to both sites may offer an explanation for their shared name. To recap, I already had a fair inkling that the two earthworks given the name “seven ditches” were not exactly the same. If their identifications are accurate – and there are more indications for them being established than still up for grabs – the locations are quite different. The Dorset one, recorded in a not especially-reliable charter text (S 630) dated 956, is midway down/up and parallel with the eastern flank of a ridge running more or less north-south, whereas the Surrey one sat atop a much higher chalk ridge (at the second highest point on said ridge for that matter) although we do not know its orientation. This may be reflected in the ways in which they are recorded in the two boundary descriptions. The Surrey instance is given as the start and end point for the perambulation of the Farnham estate, whereas in Dorset “seven ditches” occurs in the middle of the clause and only does so because the boundary touched a “gate/gap” at or in its southern end. My visit took place at the end of summer 2013, as the main excuse for a sounds-more-impressive-than-the-reality walk to End of the Road festival. I’d spent the previous night camping at Sixpenny Handley (you might like to do the same – I highly recommend the hefty locally-sourced pork belly available from the appropriately Old English-named Hanlega’s on-site restaurant), the centre of the primary landholding described by the boundary clause of S 630. It’s a charming hill village, in a modest, English way, quite unlike the vertiginous Italian ones I’d seen from near and far a few weeks previous. The location of “seven ditches” lies about a mile south-west of the village, making for a short walk across fields and along high-hedged tracks. The earthwork itself is only partly accessible/visible from public highways and byways and of course it’s not the done thing to trespass on private land, so please make do with the following report gained from jumping gates and squeezing through barbed wire fences while carrying a very large rucksack on my back – no doubt to the amusement/bemusement of a family who I caught sight of watching me from a field gate. 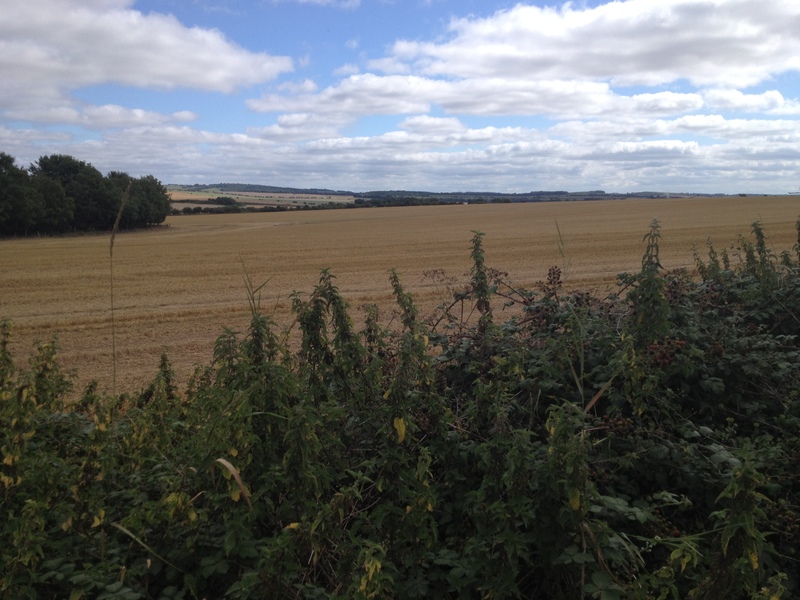 I came to the earthwork from its north-west, across an expansive and recently-harvested arable field. 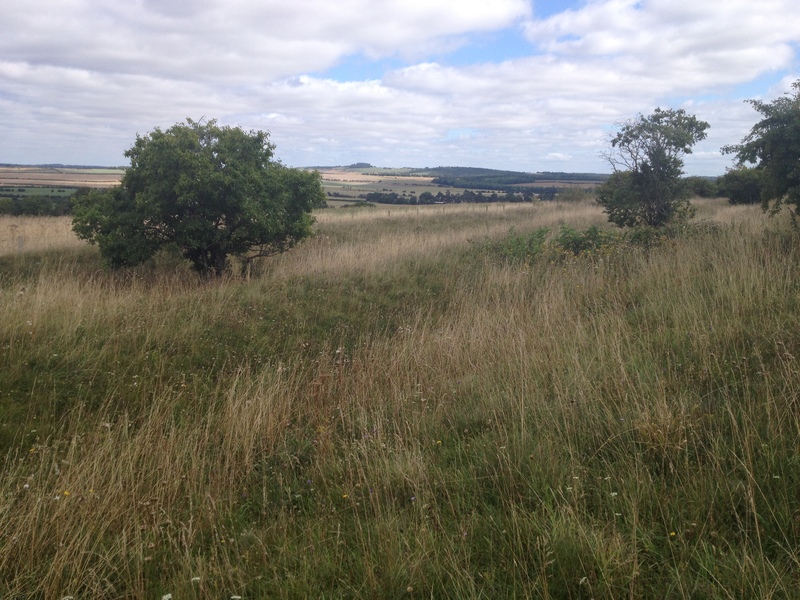 The lie of the land means it doesn’t stand out in the landscape until it is viewed at quite close quarters, as is evident from the photo below. In order to give you a better understanding of the earthwork and what I learned from seeing it in the flesh (or earth, I suppose), it’s first advisable to provide a means of getting a sense of it in its totality. To this end, the following map and panoramic photograph show the earthwork in its topographical context, reinforcing the comments made about its mid-slope situation. The numbers apply to different points along the extended ditch complex and will be referred to in the discussion (and lest you be in any doubt, yes, 1-4 do correspond to the same features on map and photo). One of the more interesting features of the Dorset “seven ditches” perceptible from the historic and modern Ordnance Survey maps is the continuation of its line to the north as a continuous, anything-but-straight field boundary running for almost a kilometre (1). Its jagged line marks it out from the other field boundaries hereabouts, particularly to the west. 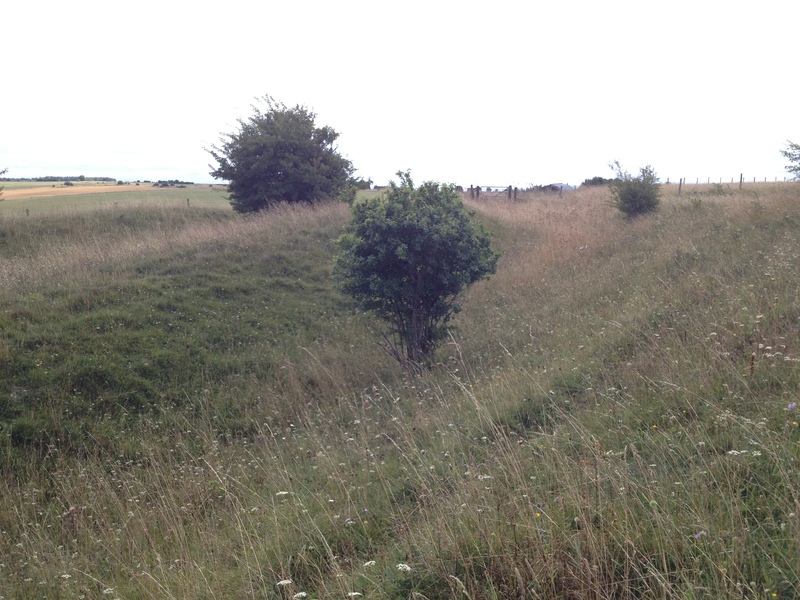 Prior to my visit, I had thought this may take the form of a reduced-sized version of “seven ditches” proper, but in reality the boundary exists as a species-rich hedge, barely banked, with no difference in the ground levels on either side (at least on the section I walked along). Most important of all, however, is its lack of a ditch. Even allowing for the destructive effects of agriculture over the centuries, the contrast with what lies to its south seems sufficient to dissociate it from “seven ditches”, which hence may be understood as a somewhat shorter extant linear landscape feature. The earthwork which I believe we’re on firm ground in identifying as the 956-recorded “seven ditches” is bisected by the A354 and may usefully be considered in two distinct parts. The northern section (2) is the more complete. Where I could gain access to it – which was only to its northern and middle portions – I found the ditch to be up to two metres deep (maybe even a little deeper in places) and in excess of five metres in width. Most interesting, however, is its lack of any bank on either side; the edges of the ditch are flush with the surfaces of the fields (arable to the west and pasture to the east, although satellite images available via Bing Maps reveal the latter is a comparatively recent introduction). 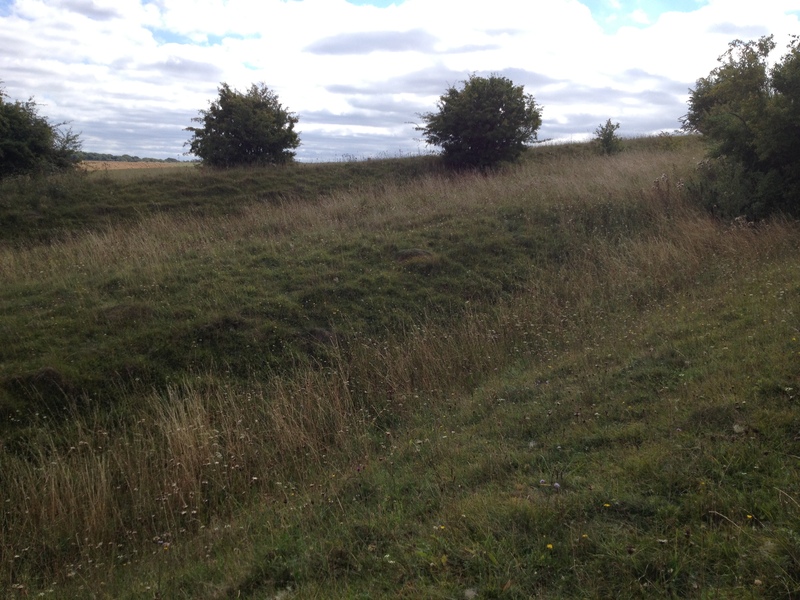 The ditch could be said to resemble a hollow-way, with material from the sides of the ditch having cascaded down to give it a more V-shaped section than it originally had. Another feature not in evidence on the ground is the shorter parallel ditch to the west mapped in the 1870s. Across the main road, the southern section (3) is not so wide. 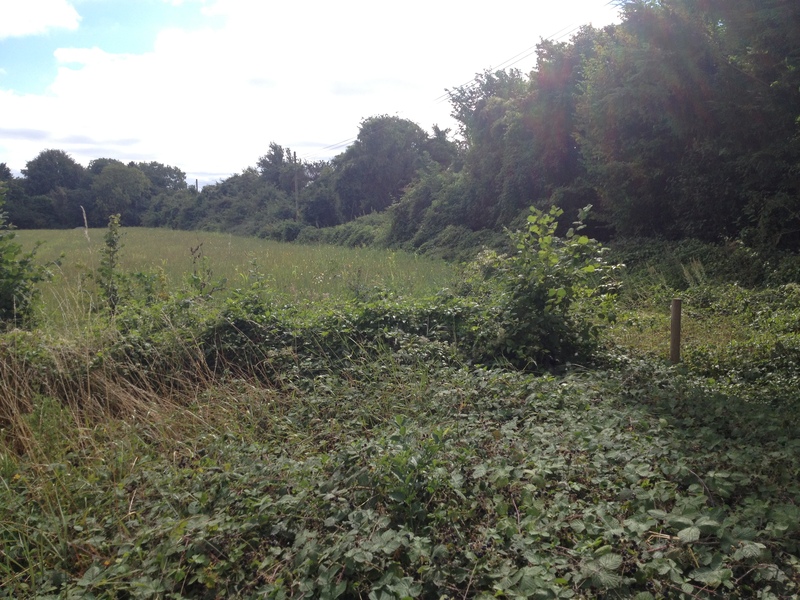 This could be due at least in part to the construction of an access lane to Canada Farm (of which more shortly) along its western flank – I could not get a sense of the extent of any encroachment here because this section of “seven ditches” is more heavily overgrown than that to the north. For precisely the same reason, observations that there are no associated banks and the ground on the west side is slightly higher than to the east of the ditch may not reflect a situation of any great antiquity. 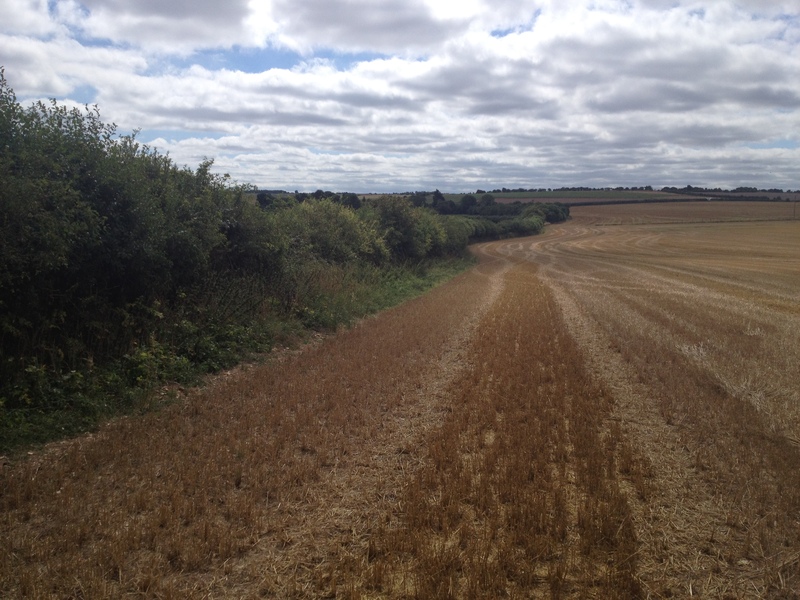 The double-whammy of agriculture and the creation of the access track may have put paid to any parallel western ditch such as survived on the other side of the road into the 1870s. Nevertheless, what does survive gives grounds for concluding that the two sections of ditch belong to what was once a single feature of unusual sunken form. The site of þat get at seuen diche suð ende, “the gate/gap at the south end of seven ditch(es)” can be placed in locality of Canada Farm (4). The farmhouse looks to be of nineteenth-century construction – a barking dog didn’t allow me to get close enough to make a proper inspection – and the name is typical of post-medieval labels for outlying farmsteads or pieces of land. Quite where þat get should be placed is moot. 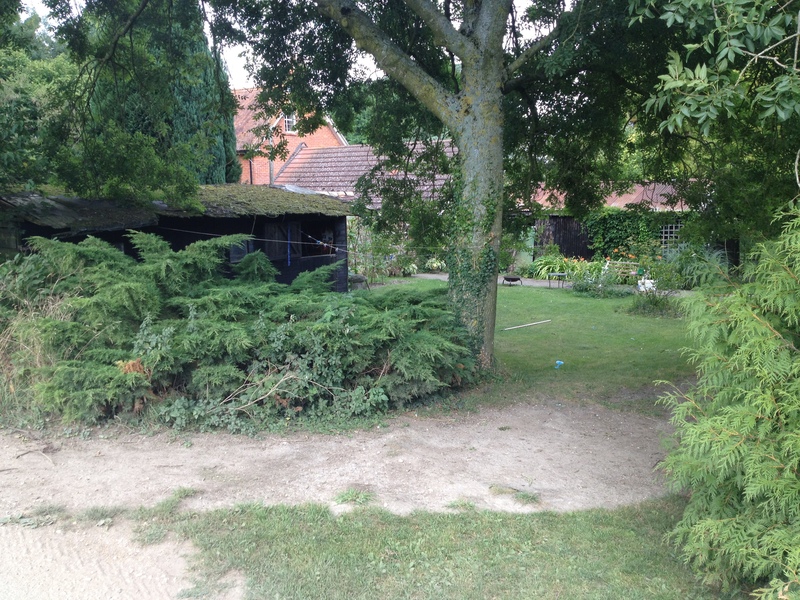 The present Sixpenny Handley parish boundary meets the earthwork at OS grid reference ST 992147 (approx.) to the north-west of Canada Farm, whereas the true southern end of the ditch – or rather where it intersects with a different set of linear earthworks – lay around ST 993146. Either way, the construction of Canada Farm and the ensuing activity associated with its operation has caused the “gap” to no longer be tangible, either through destruction or, to be almost hopelessly optimistic, by being covered with dense vegetation. From þat get, the 956 bounds proceed anlang diche. Again, from the spelling it would appear a single ditch is being referred to. Inspecting the earthwork in question, however, reveals it to be double-ditched, moreover with indications it was always thus. 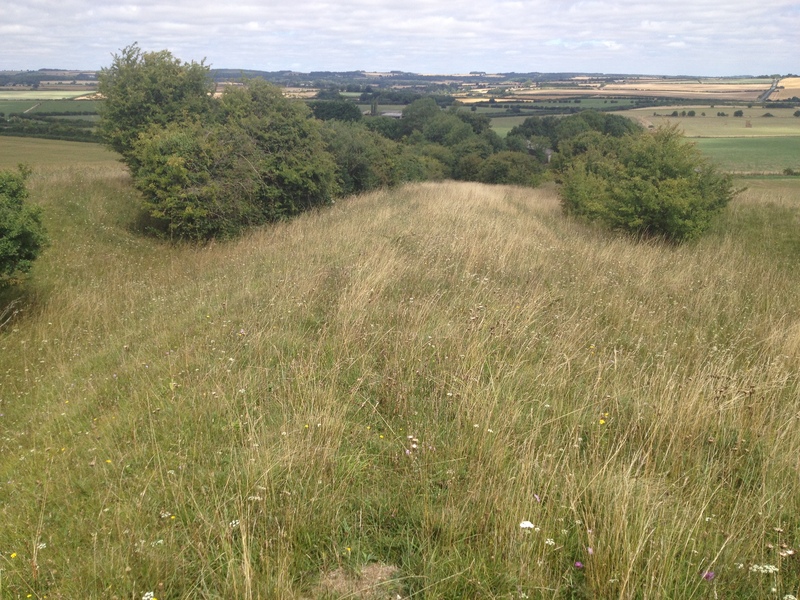 (I also found it to be covered by wildflower and butterfly-rich chalk grassland, which made a change from the brambles and nettles of “seven ditches”. The stretch heading uphill south-west of Canada Farm (5) comprises two parallel ditches of equivalent depth, the western one being the wider of the two. 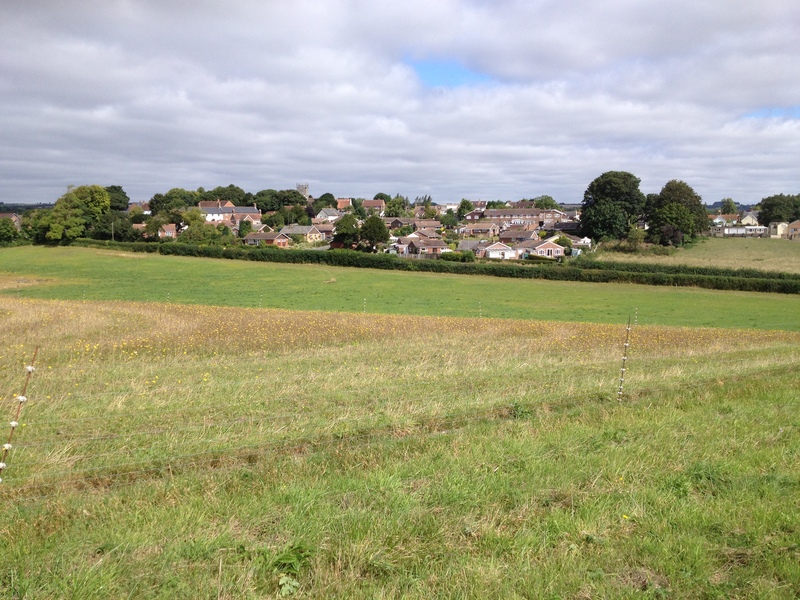 They are separated by a flattish-topped berm of roughly five metre’s width, and both are bounded by external banks that are higher than the ground beyond (a characteristic which may or may not have something to do with the cultivation of the adjacent ground). Such is their similarity that it is hard to believe one of the ditches could have arisen before the other (or, to put it another way, that one post-dates the S 630 charter boundary description). The southern end of this alignment of ditches (6) is rather confusing on the ground, long grass or no long grass. The western ditch takes a different orientation to its counterpart, appearing to deflect towards the adjacent Gussage Down Late Iron Age hilltop settlement (whose site was being mown by a farmer who gave me a cheery wave from the cab of his tractor) as if once used as an access trackway to/from it. This hints at – but does not prove – contemporaneous use, and similarly it is far from certain that the aforementioned double ditches originated in the same period as the settlement. 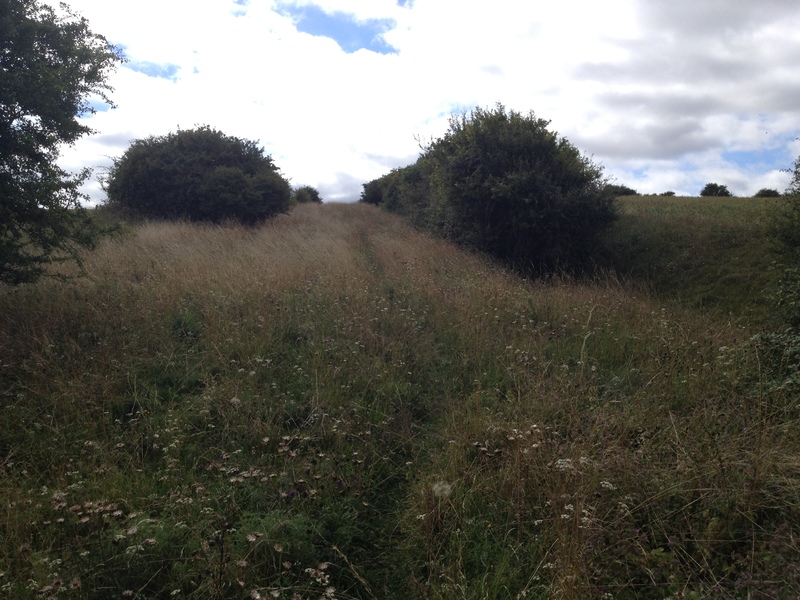 What is more, the earthworks as they survive today provide no proof that their original use was as trackways rather than sizeable (and symbolic?) land divisions. From here, three more or less parallel ditches head more or less due west in a shallow arc following the line of the northern lip of Gussage Down (7). 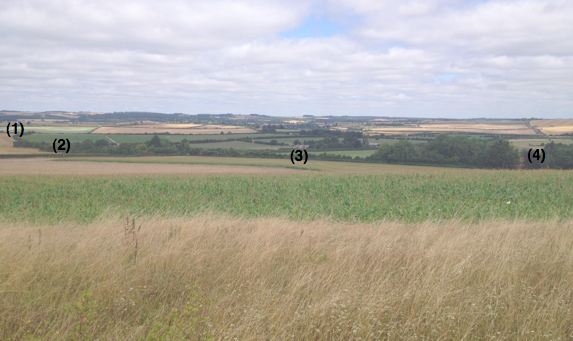 The northernmost of the three is bounded by a further bank separating it from the field beyond, whereas the southermost ditch has no such boundary feature; the top of the ditch is level with the pasture abutting it. This reflects the way the ground falls away from south-north. The trio are not equidistant from one another, with the northern two being closer together and the middle and southern one separated by a wide berm. Not far to the west of where these earthworks are bisected by the Jubilee Trail (and I said hello to a walker who was enjoying a much more substantial lunch than I had brought along with me), the three ditches become two and then one (8). Again, there is a bank on the northern side but not on the south. It continues as a single ditch ‘n’ bank following a winding course for some distance before it elides with an access track serving a model aerodrome, which diverted my attention for a good few minutes. 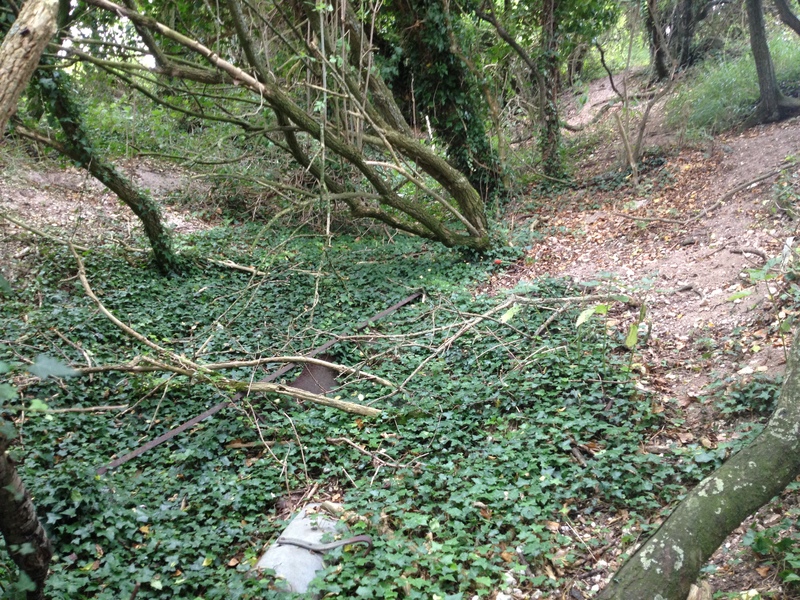 The ditch reappears on the southern side of this track for stretches, sometimes even as two overgrown parallel ditches, before disappearing somewhere around its junction with the A354. I have written the following according to the order I walked it (okay, so I’ve had to omit some doubling-back caused by not wanting to walk alongside an A-road). Recently, I found that the whole extended earthwork complex is described in some detail travelling in the opposite direction, i.e. from west to east, in its listing as Monument 210005 on English Heritage’s PastScape database. I thought it might be helpful if I reproduce the key sentences here, interpolated with the same numbers used above for the various sections and points of interest I noted during my visit. It goes on to note signs of field systems on similar alignments to the ditches to the north and west, the merest hints of which can perhaps be discerned on aerial photographs available online but as cropmarks rather than above-ground features – there was no trace of such things palpable on the surfaces of the fields I scurried across. My visit to this remote corner of Cranborne Chase did not provide an answer to the question of what the significance of the word seven is in the name “seven ditches” and so whether this might be applicable to its Surrey namesake. Such things will have to be established some other way (I have the number seven-themed part of Aldhelm’s Epistola ad Acircium to get through for starters). The most important thing I did learn was that diche, used not once but twice in the Sixpenny Handley boundary description, may look like a singular form but can be correlated with extant parallel linear earthworks which reveal it to be a distorted plural form. I have translated seuen diche as “seven ditches” throughout this account. Others have done so before me, but always on the basis of the numerical implication of the qualifier (Kelly 1996, 91; see too footnote 2 of LangScape’s edited version of the boundary description for the comment in that the meaning of the name is ‘Perhaps “seven ditches”, but the ditch itself may be called “seuendich”‘). I knew from the 1613 mention of the name and the later nineteenth-century cartographic depiction of a shorter, shallower ditch-like earthwork to the west of the surviving northern section that there were further reasons for translating the tenth-century form thus. However, experiencing the earthworks in the landscape and making careful field observations permits the same interpretation to be advanced with added topographical justification.